Glen MacKintosh scored a hat trick as Newtonmore extended their lead in the Marine Harvest Premiership to four points with a 4-1 away win over Lovat while Kyles dropped a point in a 1-1 draw with Glenurquhart. 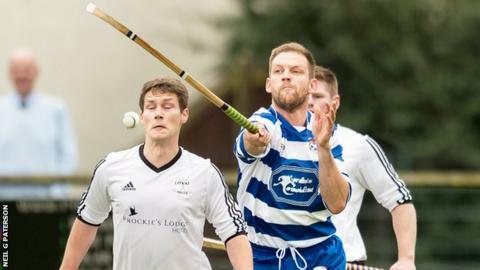 Kingussie took a step away from relegation play-off danger when they came from behind to defeat bottom side Inveraray 2-1 as Oban Camanachd, who currently occupy the second bottom spot, went down 4-1 away to Kinlochshiel. MacKintosh got the first two for Newtonmore before Cameron Binnie made it 3-0 early in the second half. Greg Matheson pulled one back for Lovat and MacKintosh completed his hat trick to round off the scoring with three minutes left. At Tighnabruich, Robbie MacLeod put Kyles ahead in the first half in advance of Fraser Heath's dramatic 92nd-minute equaliser that confirmed third place for Glenurquhart. This leaves Kyles on 22 points and Newtonmore are top on 26. Both teams have four to play. At Balmacara, Finlay MacRae and Keith MacRae scored on either side of half time to put Shiel 2-0 ahead, while Fraser MacVicar and a last-minute goal from John MacRae rounded it off for them. Malcolm Clark grabbed Camanachd's consolation. Kingussie lived dangerously when Inveraray took the lead with a goal from David Robertson but eventually took both points with strikes from James Hutchison and Bob MacGregor. This all but relegates Inveraray, who would require a major turnaround even to reach the play-off place. Glasgow Mid Argyll confirmed third place in the National Division behind champions Skye and Kilmallie with a 2-1 victory at home to Caberfeidh. Craig Anderson got both for Mid Argyll and Craig Morrison scored for Cabers. Fort William's reserves were presented with the North Division 1 championship trophy at Newtonmore following their 4-4 draw with the home side's second string. After an hour, Fort were 4-1 up, but although Newtonmore eventually squared the game, one point was all Fort needed to win the title.